Visit us on your next wine country excursion. Our tasting room is in the center of our 23,000 square feet wine cave, in the heart of the production facility. You walk through the crush pad, around the fermenting tanks through beautiful Redwood portal doors into the cave. 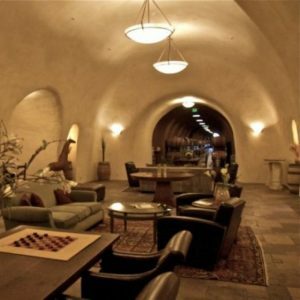 Stroll past hundreds of barrels full of wine to the center of the wine glass shaped cave and into the Grand Room. Sit comfortably in overstuffed couches and chairs, instead of standing at a crowded tasting bar. You’ll be greeted by one of our hosts, Bill Klein, our tasting room manager, Ben Larks, who before pouring Deerfield wine was making it, PJ Rex, the winemaker’s wife, one of our other hosts or perhaps Robert, the winemaker, and Walker, the winery dog. You’ll have the opportunity to relax and savor various flights of wine selected from the 20 wines made by Deerfield. Your taste and our hosts will guide you on a sensory experience that is much more than the average tasting. Tasting fees, which range from $10 to $25 per person can be applied to the purchase of three bottles of more. The wines range in price from $18 to $125 per bottle. VIP tastings at Deerfield Ranch, the ridge top home of Robert and PJ Rex and their first winery, can be arranged by appointment. The fee is $65 per person. PJ and/or Robert will be your host. To schedule a VIP tasting call (707) 833-5215 No appointment is necessary to visit the tasting room and winery on Sonoma Highway for individuals or for groups less than 8 people. For groups of 8 or more we ask that you make an appointment so that we may be better prepared. To schedule a group appointment call the tasting room at (707) 833-5215. If you would like to schedule a special event in the cave or at the winery please contact our Events Coordinator Bill Klein at (707) 931-4637 or bill.klein@deerfieldranch.com For more information email: winery@deerfieldranch.com.